This book is captivating right from the front cover, and continues not to disappoint throughout. 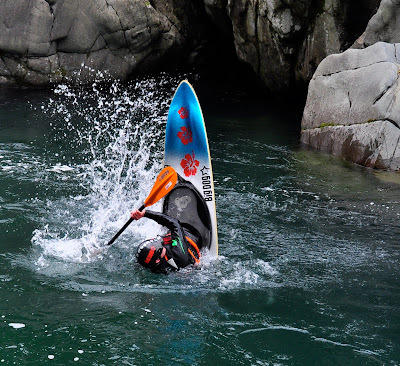 One of the problems I know only too well as a paddling author is how to cover all aspects of such a diverse pastime without creating vast swathes of material that half your audience just aren't interested in. The secret, of course, is to be engaging and inspirational. Everyone appreciates a beautiful photograph or an elegant turn of phrase, even if the content isn't their current obsession. This book nails it. The book is subtitled "100 Extraordinary Paddling Experiences", and each takes the form of a stunning full page photo facing a page of text, which also supplies some small inset maps and tips on how to check out the location. It's designed for people who actually want to do this stuff, and it's all killer, no filler. With a double page for each adventure plus indexes, the book rounds out at 207 pages. Knowing the background of the authors, I expected this work to bias heavily towards whitewater paddling, but the range and balance is impressive. From the canals of Venice to the lagoons of Fiji and from icebergs to waterfalls, the book is a travel cornucopia, and every turn of the page puts a smile on my face. 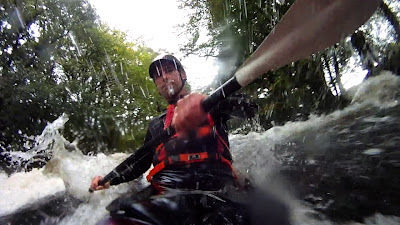 It's got its fair share of whitewater, as of everything else, but it's all expertly presented to be inspirational and interesting to anyone, paddler or not. 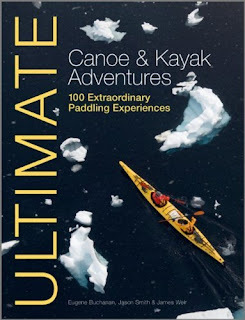 I'm always loath to claim something is a "must have" or should "be on every paddler's coffee table", but in this case I must say I defy anyone not to enjoy every single page, and to want to show it to friends and family. There are a lot of good paddling books out there, but this one is unique in what it's set out to do and has exemplarily delivered. I know I'll continue to pick it up again and again. I highly recommend it. 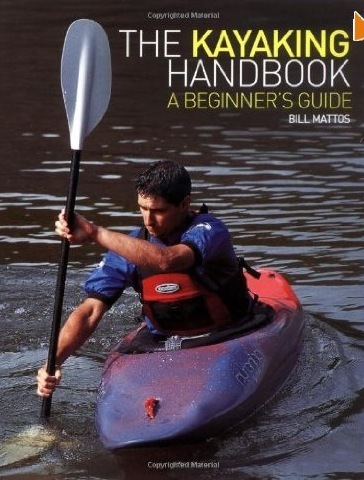 "The 1001 versions of Mattos' other general paddling book has been consistently the best selling UK paddlesport book of the past decade, if the Amazon rankings are any guide." 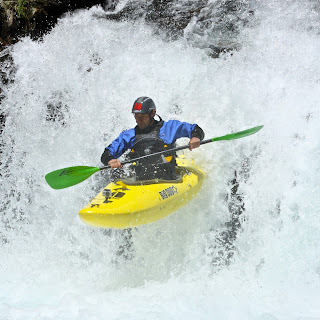 The forthcoming Haynes Manual of Kayaking is designed to achieve something else. My "Practical Guide(s) to This and That" have sold really well, and I hope they've been useful if only as a paperweight or to level the kitchen table, but the real tipping point (pointless paddling pun)(awful attempt at alliteration) was the book Kayak Surfing, which was a labour of love that I never expected to sell a lot of units. There just aren't that many kayak surfers. I'd become disillusioned with the dry, informative, supposedly authoritative style that I had been asked for in the past, and begged the publishers to let me write it informally, as if I was talking about it face to face, and to present the photographs more randomly as if in a magazine, so that each page could be laid out as best suited the material. And luckily, people loved it. Debra Searle MBE described it as "The best instructional book about any sport, ever. All books should be written this way." Other people said nice things, too. GoPro video experiment. Click to watch it on Vimeo. Thanks to Kelly Adventure Centre for the pool. I view the world suspiciously. I do. I don't mean to be cynical, but at the same time can't help noticing that there is a lot of misinformation going on around me. Most of it is not my job to unravel. But when it comes to rolling I feel I have to speak out. Most of what you're told about it is smoke and mirrors. When I learnt to roll, it was from a book. I was twelve. I read the page about rolling over and over again, and I didn't really understand, but went out to try it anyway, all alone on a freezing November sea. Which I don't recommend, frankly. After a few attempts I was exhausted from swimming and emptying my boat. But I persevered, day after day, and you know what? I got absolutely nowhere. The problem was that I didn't really understand the critical part. So much emphasis was placed on upper body motion, sweeping with the paddle in a specific way, throwing the head back flamboyantly at the end, that I didn't focus too much attention on the hips. The book mentioned something called a "hip flick" but it didn't make a lot of sense to me, so I sort of glossed over it. Shame really. Because the hip flick (or hip snap as some like to call it) is the only bit that matters!!! The rest of the stuff coaches tell you to do is just overcomplicating the situation, giving you seventeen things to think about so that your chances of doing them all at once are slim. Anorexic, even. But almost no one gets the hip motion intuitively. So it needs to be backed up by a little bit of this and that. I say, throw off the shackles of your tormentors! Probably they are trying to help, but I sometimes wonder if sub-consciously they just want it to be as difficult for you as it was for them. It isn't difficult. It's easy. All we have to do is crack this hip business. Why do learners of the roll have trouble grasping it? I think it's because by the time we learn to kayak, we can already walk, run, jump, and in many cases do handstands and somersaults. In adulthood, we try to relate every new skill to a kinaesthetic experience we are already familiar with. And most people do not do anything in normal life that involves rotating one's hips from side to side in relation to one's torso, through a range of 90º or more. Yes folks. That's the move. That's all it is. It's weird to practise it on dry land. It's hard to practise it anywhere. It's just a totally unnatural motion, until you can do it. Then it seems like the most natural thing in the world. I finally mastered it, about two years after my first abortive attempts, by standing in the doorway of the broom cupboard brandishing a yard brush instead of a paddle. But that's just my learning style. It needn't take two years. Half an hour would be more acceptable. 1. Draw, or find, a line on the ground. 2. Stand normally with your heels against the line. This is you sitting in a kayak. The line is the surface of the water. Stop thinking now. 4. Next, stand up for a moment, and turn around to stand facing the opposite way. 5. Put your toes against the line. 5. Bend over. Feel foolish yet? This is you sitting in the kayak upside down. The line is still the surface of the water. You are mostly underneath it. I said stop thinking. 6. Staying bent over, try to arch your head and torso around to one side as far as you can. I'm not especially bendy, but I can twist around until my head is somewhere over the line. That is analogous to being able to get your ear to the surface, just by bending to the side. Right, here comes the clincher. 7. Without moving your torso at all, jump a little and rotate your legs/feet only by 180º on the line. It's really easy. 8. Have a look at where you've ended up, and remind yourself that your upper body didn't move at all. Viewed from the ceiling, it was kind of along the line (surface). It still is, or should be. 9. Do the little jump/rotate again. That's like rolling the other way, in your frame of reference. You can think now. 10. Keep practising. Get it dialled in. Try it as bent over as possible. But make sure the feet jump 180º each time. That's it. That's how you really roll a kayak. 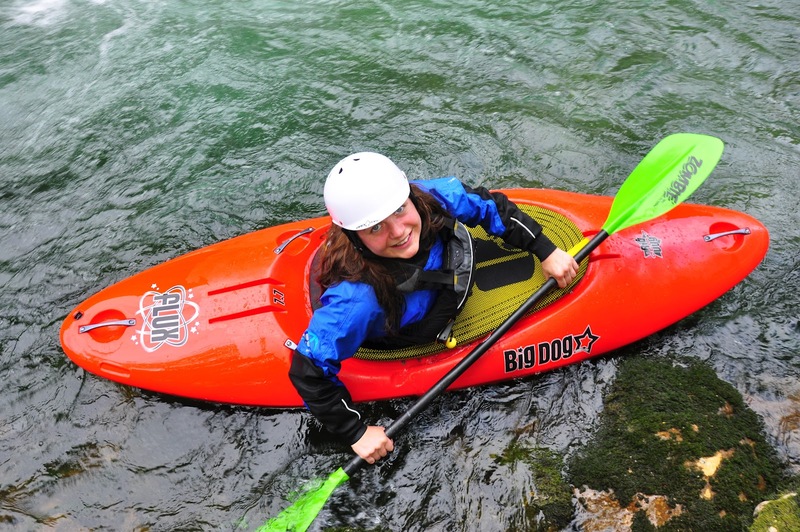 All the upper body language, the paddle stuff? Icing on the cake, my friends. Handy, but not mission critical. Did you notice how we didn't talk about hips at all in that sequence? That's because moving your hips in that plane isn't a particularly normal thing to do or think about. Whereas everyone knows how to move their head and feet. What can go wrong with this strategy? Two things. To make it stick in the real world, you need to fit in the boat properly so that your feet, knees and hips cannot move whatever you do. Maybe not gonna happen in a borrowed boat at the pool. The other problem is getting all tangled up with the paddle. Capsize with it along the boat as "normal" coaches always tell you to, and it should be above the water-ish when you are upside down. Leave it there. Don't worry about it. If you must worry about it, try to reach around the hull of the boat with your back hand and rest the joint of your thumb on the boat somewhere under (over) the seat. Bend to the side the paddle is on. Do the leg thing just as you did at home. You're up. BAM! As you may already know, I'm working on a kayaking book at the moment. The details must, for now, remain shrouded in mystery, but it's not revealing any secrets to say that it'll have a lot of photos in it! In theory, I'm on the home straight with this project now, but the English weather is conspiring to make my photos brown and miserable. It's been raining and windy for so long now that I started to wonder if I should abandon the book and start building an ark instead. But perserverance is the only way, so we press on regardless. I take my hat off to my friend Pete Thompson for donning a T-shirt and trying to make a sea kayak skills shoot look as if the weather is, if not actually tropical, at least borderline tolerable. A man whose house overlooks the estuary just stopped me in the street and asked what time high tide will be. By no means an uncommon event. The high tide, I mean. They come twice a day, and are never more than an hour later than yesterday, so it shouldn't be too hard to get a handle on the situation. But difficult it clearly is, and especially so if you have just arrived somewhere new or perhaps haven't thought about the sea for a while. 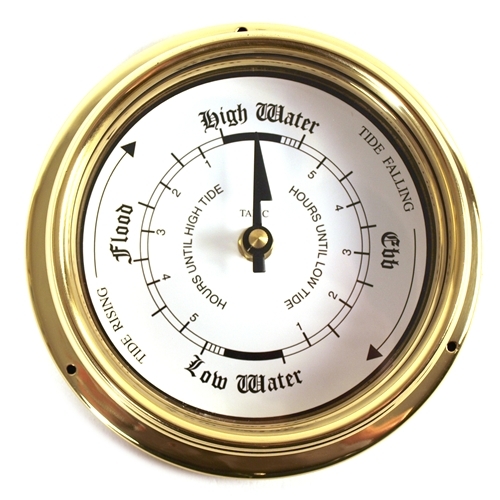 So there are at least three tried and tested ways of knowing where the water lies. 1. 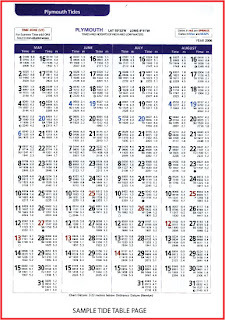 Tide table - you can purchase them in most seaside newsagents. Looks confusing, really isn't. 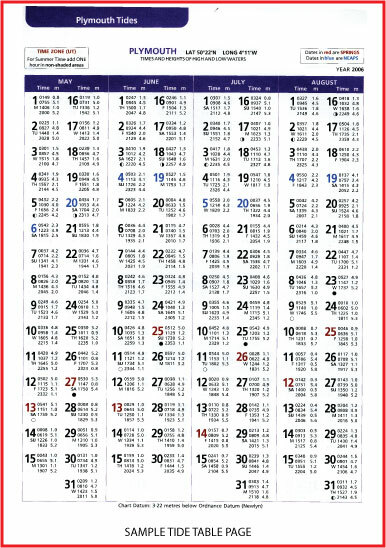 The only think you need to know is whether it's compensated for daylight saving time or not. And nowadays they usually are. Set it once at high tide and it will be right for ever more. Clever, huh? Because the tides aren't at weird random times. Who knew? 3. Tide app - obviously only gonna work if you have an internet connection. 4. Look out of the window and switch on your brain. 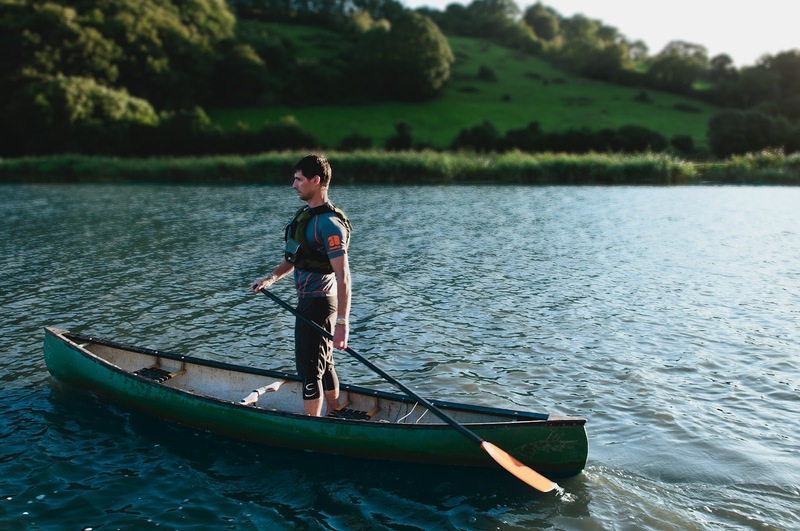 "What sets a canoeing expedition apart is that it purifies you more rapidly and inescapably than any other travel. Travel a thousand miles by train and you are a brute; pedal five hundred on a bicycle and you remain basically a bourgeois; paddle a hundred in a canoe and you are already a child of nature." The brief was simple. I needed photos for my book, Josh needed photos for the Big Dog catalogue. What could be simpler than to put one of every boat in a van and go shoot somewhere the water is bubbly and the sun always shines? 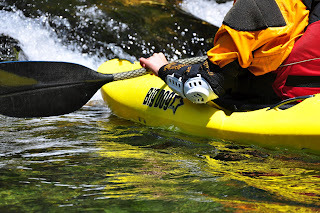 Well, Josh arrived at my house in the French Alps with Hazel Wilson, (R&D @ Nookie) and after the obligatory wine and cheese, we took off to a local rapid near Annecy to check out all the new boats and equipment. 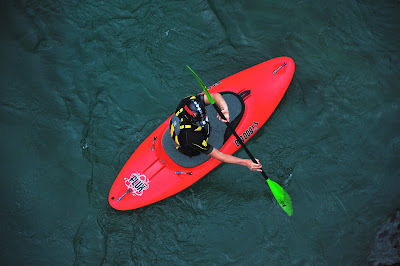 And remind ourselves how to paddle and use a camera. The hardest thing for whitewater adventurers is to remember that big action, spray, blood, sweat and tears are not always the best content, and that pretty water and good composition are often far more important. 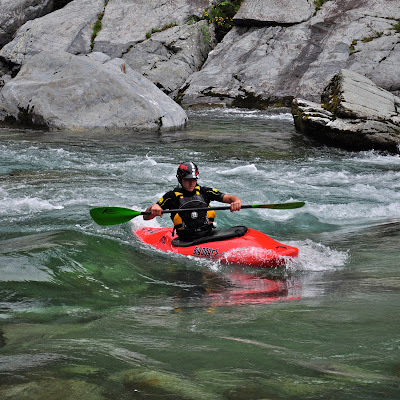 It's also difficult to think about photography and be creative when you are concentrating on your own paddling, logistics like food and shuttle, product placement for sponsors, and team dynamics. Paddler Hazel Wilson - A slow shutter shot with fill flash to freeze the action. But once we'd perused the snaps over some more wine and cheese, we concluded that we were good to head out to Val Sesia, a classic destination for all Brits and Euro boaters, renowned for its turquoise waters and granite slides. 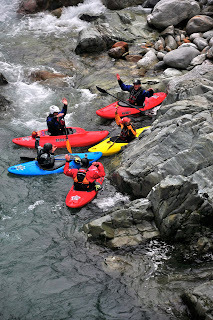 We had five days to shoot everything from beginner kayaking thru play paddling, technical whitewater to waterfalls. Oh, and squirtboat and lifestyle shots, too. What could possibly go wrong? 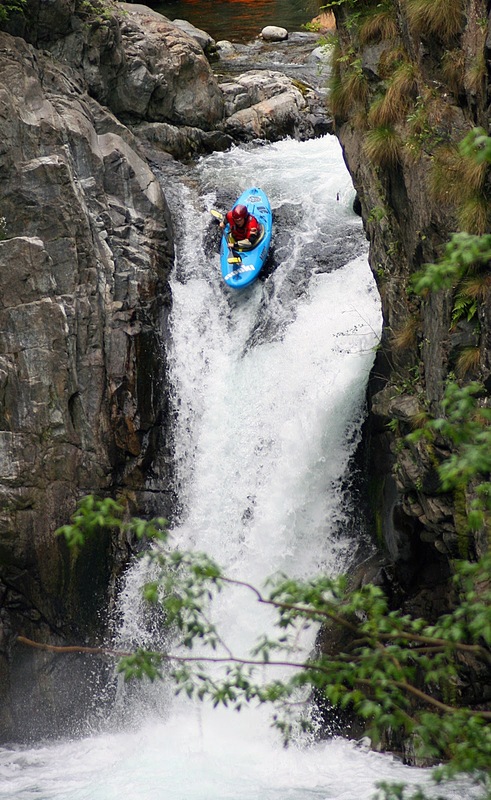 We met up with the Big Dog team at Campertogno, Val Sesia, and set off to shoot some classic white water on the Egua. 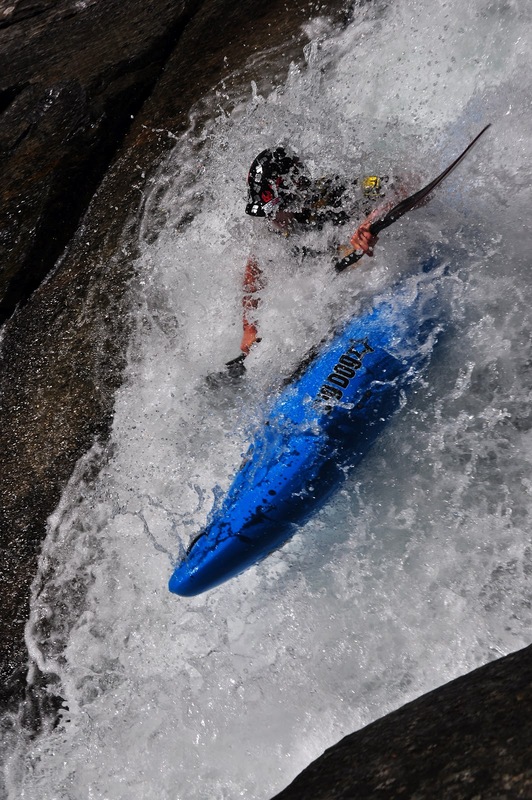 Bob McKee and Toby Hüther styled it up in the OC1's, running great lines on tight technical rapids and waterfalls alike. 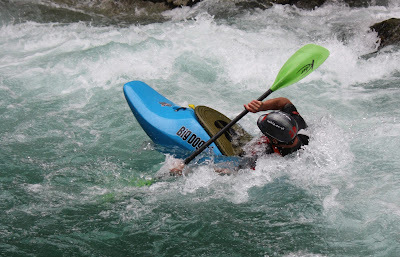 The rest of the team were mostly in Force and DropZone kayaks which performed equally well at delivering stylish moves in hard whitewater and even harder rock. We set up safety cover on a few of the tenser exits but generally this was fun in the sun and playing up for the cameras. There were a whole lot of boats to test and shoot, so we needed different types of water. 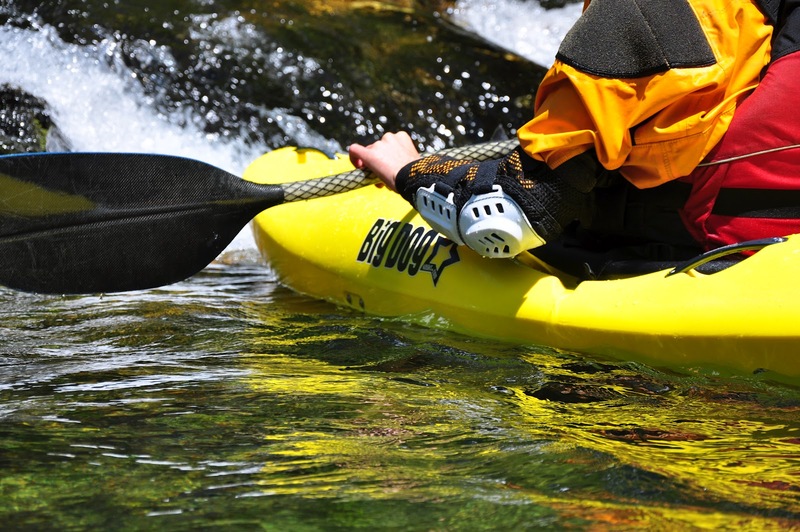 Here's Josh in the Flux, which is a crossover boat for intermediate river running and cruisy play paddling. Val Sesia is not known for its play spots - you wouldn't believe the trouble Josh went thru for this little wave! After a mission to get across Europe in time for various commitments, and a worrying six hours in Calais (apparently ferry companies don't like rough water as much as we do) I'm now back in the UK. Here's the official press release about some big changes concerning me and my former company Nookie. Bill Mattos, CEO, and co-founder of Nookie with Helen Stewart in 1991, has stepped down after 21 years to pursue his increasingly busy writing, ranting and paddling career. Helen Stewart (design and production manager since the beginning) is being joined by two new directors, Dan Hawes (sales and marketing at Nookie since 2005) and Hazel Wilson (R&D at Nookie since 2006). Though Bill will no longer hold an executive position with the company he remains a shareholder and will continue to work closely with Nookie. Bill is currently developing a number of new projects that will feature in the Nookie brand in a big way. The team at the UK based company are all very fired up about the future at Nookie and looking forward to some exciting times ahead. Helen, Dan and Hazel with multiple decades of combined experience will continue to take the company forward with a host of interesting new projects and products in the pipeline. So you may be aware that I'm working on an all-new book project, which I'm super-excited about. I've been writing short sections in fits and starts for a while, in and around doing Nookie stuff and other work, but sooner or later it has to get properly organised. So today has been page plan day. I haven't actually done that before - on previous book jobs I've written about all the different things I wanted to and someone else has organised them into some semblance of order, left out a bunch of stuff that they didn't like, and told me what was missing that I still needed to write. But since this time I am supposed to plan it myself, I've got a big spreadsheet which I am colour coding in the kind of artful procrastination to which only writers and students can truly relate. Yes, I can even procrastinate over the planning stage. I've washed the car, taken out the trash, called my mother, and drunk my body weight in tea... but finally, the page plan is complete. 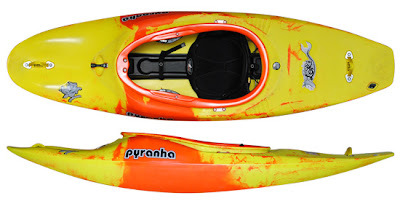 Despite the rave reviews the testers were returning, the boys and girls at Pyranha are perfectionists, and the boat kept being put on hold until all the kinks were ironed out. But now it's done, and I have a blind date with it at the weekend. And I can't wait. First impressions is that it's faithful to the brief, to create a boat that rekindles the fun we used to have in slightly longer, slicier boats in decades past. From a glimpse of video I saw, it seems loose on a wave and retentive in a hole, and the tail sinks and pivots beautifully. My only reservation is that the front end seems a bit more voluminous than my beloved Prozone (which went off without me in the end, because I was trying to be clever), but that's probably a good thing, because my legs/feet are a bit creaky these days. And I've always had a pretty strong smash anyways.